Animations of GOES-16 Visible, near-Infrared and shortwave Infrared over North America shortly before the Vernal Equinox, and shortly after the Autumnal Equinox, (that is, when the Sun is overhead in the Southern Hemisphere) show bright spots that propagate quickly from west to east (these features were first noted by Frank Alsheimer of the National Weather Service). The animation above shows the visible imagery (0.64 µm) over the Continental United States on 5 March 2018 (Click here for a slower animation speed). Brightening over regions between 30 and 40 N between 1637 UTC and 1732 UTC is apparent. The animation below of the shortwave infrared (3.9 µm) shows slight warming (Click here for a slower animation), as might be expected with reflected solar energy. The brightening is also apparent in the Band 4 “Cirrus” (1.37 µm) — in fact, a closer look at southern Colorado reveals the bright signature of sunlight reflecting off solar panels at the Alamosa Solar Generating Facility (Google maps). The increased reflectance can cause the ABI Clear Sky Mask to mis-characterize clear regions as cloudy (See the animation below; click here for a slower animation). Thus, Cloud properties (Cloud-top Height, Temperature, Pressure, etc.) can be identified in clear regions. The bright spots in the visible, and warms spots in the shortwave infrared, occur when the Earth’s surface, the GOES Satellite and the Sun are aligned on one line. If you were within the bright spot with a powerful telescope trained on the Sun, you would see the GOES Satellite transecting the solar disk. The location of these bright spots changes with season: they appear in the Northern Hemisphere shortly before the (Northern Hemisphere) vernal equinox and shortly after the (Northern Hemisphere) autumnal equinox. Similarly, they appear in the Southern Hemisphere shortly before the (Southern Hemisphere) vernal equinox and shortly after the (Southern Hemisphere) autumnal equinox. On the Equinox, the bright spots are centered on the Equator. This animation (courtesy Daniel Lindsey, NOAA/CIRA and Steve Miller, CIRA) shows where the reflection disk moves during the days around the Northern Hemisphere Autumnal Equinox; a similar animation for the Northern Hemisphere vernal equinox would show a disk starting at the North Pole and moving southward with time. The animation below (from this link that is used for calibration exercises), shows the difference in reflectance (Bands 1-6) or Brightness Temperature (Bands 7-16) between 1657 and 1652 UTC on 3 and 5 March 2018. Two things are apparent: The centroid of the largest difference in solar reflectance has moved southward in those two days, as expected; the effect of this solar backscatter is most obvious in the visible, near-infrared and shortwave infrared channels (that is, bands 1-7 on the ABI). The effect is most pronounced in clear skies. This reflectance feature is also detectable in legacy GOES Imagery. However, the great improvements in detection and calibration in the GOES-R Series ABI (and AHI on Himawari-8 and Himawari-9) and the better temporal resolution with the GOES-R Series allows for better visualization of the effect. The feature also shows up in “True Color” Imagery, shown below (from this site). Geocolor imagery (shown here), from CIRA, also shows the brightening. Thanks to Daniel Lindsey and Tim Schmit, NOAA/ASPB, Steve Miller, CIRA and Mat Gunshor, CIMSS, for contributions to this blog post. GOES-16 — the first of the GOES-R series — ABI visible (0.64 µm) images captured the Lunar Umbra (or solar eclipse shadow) of the “ring of fire” annular eclipse that occurred in the Southern Hemisphere on 26 February 2017. The dark eclipse shadow could be seen moving from west to east, beginning over the southern Pacific Ocean, passing over far southern Chile and Argentina, and finally moving over the southern Atlantic Ocean. GOES-16 will routinely scan the Full Disk every 15 minutes (the current GOES Full Disk scan interval is once every 3 hours), but in a special mode can scan the Full Disk every 5 minutes. 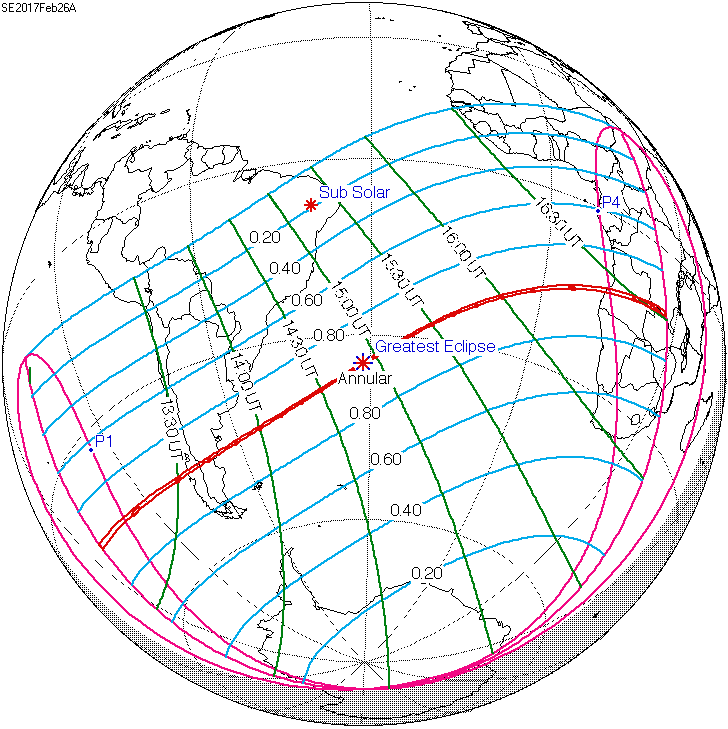 The path of the eclipse shadow (courtesy of EarthSky.org) is shown below. True-color GOES-16 Red/Green/Blue (RGB) images are shown below (courtesy of Kaba Bah, CIMSS). Note: the GOES-16 data posted on this page are preliminary, non-operational data and are undergoing on-orbit testing. The tweet shown above was issued by the NWS forecast office in Hanford, California — using an image of the GOES-15 Low Instrument Flight Rules (LIFR) Probability, a component of the GOES-R Fog/low stratus suite of products — to illustrate where areas of dense Tule fog persisted into the morning hours on 31 January 2017. AWIPS II images of the GOES-15 Marginal Visual Flight Rules (MVFR) product (below) showed the increase in areal coverage of Tule fog beginning at 0600 UTC (10 pm local time on 30 January); the fog eventually dissipated by 2030 UTC (12:30 pm local time) on 31 January. Note that Lemoore Naval Air Station (identifier KNLC) reported freezing fog at 14 UTC (their surface air temperature had dropped to 31º F that hour). In addition, some of the higher MVFR Probability values were seen farther to the north, along the Interstate 5 corridor between Stockton (KSCK) and Sacramento (KSAC) — numerous traffic accidents and school delays were attributed to the Tule fog on this day. Legacy infrared Brightness Temperature Difference (BTD) products are limited in their ability to accurately detect fog/low stratus features if high-level cirrus clouds are present overhead. This is demonstrated in comparisons of GOES-15 MVFR Probability and BTD products from Aqua MODIS (above) and Suomi NPP VIIRS (below). Again, note the Interstate-5 corridor between Stockton and Sacramento, where the extent of the fog was not well-depicted on the BTD images (even using high spatial resolution polar-orbiter MODIS and VIIRS data). Daylight images of GOES-15 Visible (0.63 µm) data (below) showed the dissipation of the Tule fog during the 1600-2200 UTC (8 am – 2 pm local time) period. The brighter white snow pack in the higher elevations of the Sierra Nevada was also very evident in the upper right portion of the satellite scene. One ingredient contributing to this Tule fog event was moist soil, from precipitation (as much as 150-200% of normal at some locations in the Central Valley) that had been received during the previous 14-day period (below). Closer views centered on Bettles (above) and on Tanana (below) further highlighted the influence of terrain on the pattern of surface infrared brightness temperatures. A comparison of re-mapped 1-km resolution NOAA-18 and “4-km” resolution GOES-15 (GOES-West) Infrared Window imagery (below) demonstrated the spatial resolution advantage of “Low Earth Orbit” (Polar-orbiting) satellites over Geostationary satellites, especially for high-latitude regions such as Alaska. As this plot shows, the true spatial resolution of a “4-km” GOES-15 Infrared image pixel over the interior of Alaska — where that satellite’s viewing angle or “zenith angle” from the Equator is about 74 degrees — is actually closer to 16 km. For the “2-km” Infrared imagery that will be provided by the GOES-R series ABI instrument, the spatial resolution over the interior of Alaska will be closer to 8 km. The cold continued across much of Alaska on 19 January, as seen on a NOAA-19 AVHRR Infrared Window (10.8 µm) image at 1519 UTC or 4:19 am local time (above). However with a lack of cloud cover over the central portion of the North Slope, surface air temperatures were much colder (in the -40s F) compared to the -20s F that were seen there on the previous day. As was shown on the previous day, closer views centered on Bettles (above) and on Tanana (below) further highlighted the influence of terrain on the pattern of surface infrared brightness temperatures. On this day a layer of clouds (highlighted by the warmer cyan colors) covered the far eastern portion of the Tanana image below — note that surface temperatures in the Fairbanks area beneath these clouds were only as cold as the -30s F. Farther to the west, which remained cloud-free, the minimum temperature at Tanana was -59ºF. Time series plots of surface weather conditions at Fairbanks, Tanana and Bettles during the 18-19 January period are shown below. Note that the surface visibility was periodically restricted 1 statute mile or less, due to ice fog, at all 3 locations.